DAML Viewer provides a means to view the instances found in a DAML document. Either browse for a local file or enter the URI of a document containing DAML, e.g. and then click Fetch to obtain the Nodes View. The Nodes View provides a list of the URIs for all resources referenced in the document. File->Open URI opens an additional Nodes View on a different URI. File->Properties displays the current URI and the number of resources and statements found in it. File->View Source displays the source code for the URI in the current Nodes View. File->Close all node view windows closes all Node View windows created from this Nodes View. 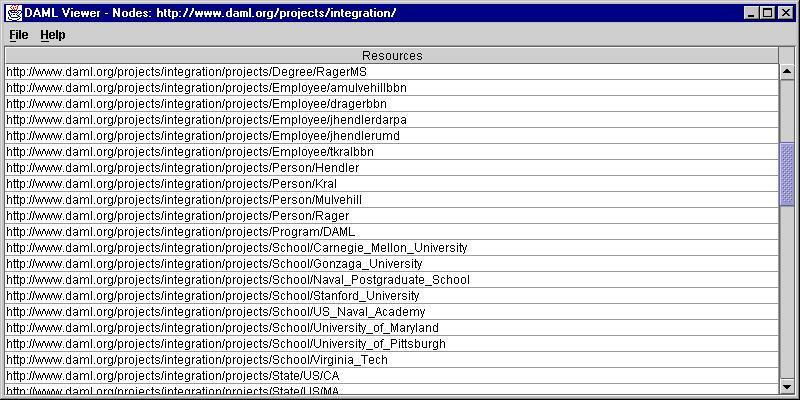 File->Exit DAML Viewer either closes and terminates the program, or merely closes this Nodes View window and its Node Views, leaving any others open, based on User Input. Help->About DAML Viewer displays the current version number. Clicking on a URI provides a Node View showing all of the statements involving that node. The Node View lists all of the statements involving the specified URI. You can click on entries in the Value column to open a Node View of the indicated node. Literals don't respond to mouse clicks. You can click on entries in the the Property column to open a Node View of the indicated property (if the ontology definitions were also included in the loaded file). You can click on the arrow ("-->" or "<--") for a statement to open a Node View containing any reified statements made about that statement. If an error doesn't respond to mouse clicks, no reified statements were included in the loaded file. Close the window by clicking on the X in the upper right-hand corner. 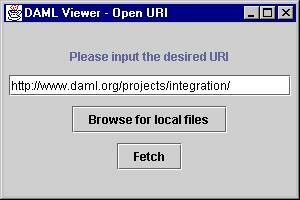 DAML Viewer is available as an applet, which can be downloaded to run in your browser (Netscape or Internet Explorer). It requires the Java 2.0 Plug-in. DAML Viewer is also available as an open source downloadable application. Download JDK 1.3 or later, if you don't have it already. Download our slightly modified RDF-API which does not crash on rdf:datatype (original). Download and unzip DAML Viewer 2000-11-21. You can use "jar xvf" to unzip on Unix systems. Edit viewer.bat (Windows) or viewer.csh (Unix) to change any installation path on your system.